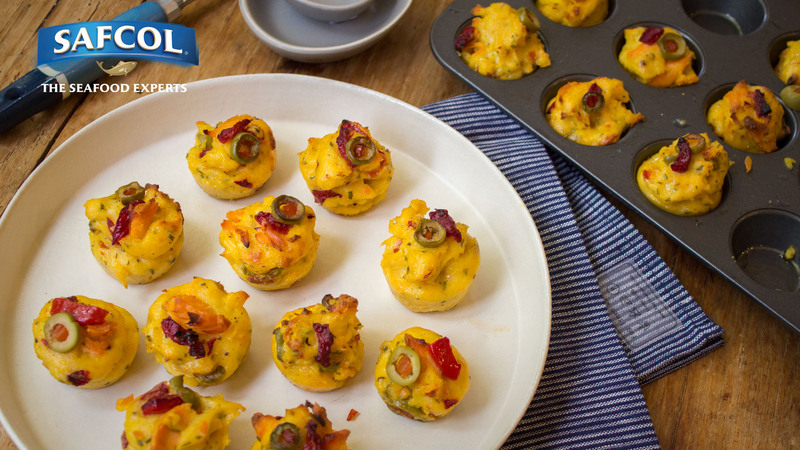 These salmon green olive polenta bites are a tasty warm canapé that can be prepared the day before and baked in the oven just before your guests arrive. 1 x 95g can Safcol Salmon in Springwater, drained flaked. Using olive oil, lightly grease a 24 hole muffin pan. Using 2 dessert spoons, divide the hot mixture and fill the 24 muffin pans. Top each polenta bite with a slice of olive and a little piece of red pepper. Cover with cling film and chill in the fridge until set or at least 1 hour. 15 minutes before serving, preheat your oven to 200°C. Remove the cling and drizzle the tops of the bites very lightly with olive oil. Bake in the hot oven until lightly crisp and warmed through, about 15 to 20 minutes. Serve warm with sour cream and hot chilli sauce for dipping.